Overall popularity of social networks indicates the necessity of its usage as a part of company’s regular marketing strategy, especially because it allows you to expose fresh insight of every situation. That’s why Facebook, Twitter, Instagram and other popular social networks stand out as excellent way to present in-booth ambient, tell people about your exhibit and encourage them to visit your stand. Therefore, engage booth staff to use social media for performing any action that may bring plenty of visitors, from frequent updates regarding atmosphere and video representation to adding valuable photos of satisfied customers and professional staff. Feel free to offer your trade show specials, gifts or discounts online, share information about bestselling products, or simply present fresh customer’s comments and testimonies. Having well-trained, polite and friendly staff in booth to welcome and inform anyone who approaches to the stand, should absolutely be the first contact you’re offering to your attendees, but bear in mind that people also like to experience the digital part of the story. This means that apart from giving verbal company’s info, you can surprise your visitors with tablets or iPads allowing them to explore your company’s web profile, see product’s features, or even to give valuable feedback by fulfilling interesting surveys. The times when paper posters and physical billboards were main advertising installation within trade show stands, slowly belong to the past and company’s success on trade show is now conditioned with the utilization of 3D technologies and multimedia contents that provide comprehensive appearance. One of the greatest technological responses to better attractiveness of your booth is the implementation of excellent hanging banners, which you can use to represent your company, products and services in interesting way. Continuous broadcasting of high quality videos related to your business performance and best offerings will not only entertain your current visitors, but will also draw the attention of bystanders and random passers on your stand. On the other side, in-booth staff will have time to steadily communicate with attendees, instead of being under pressure while trying to occupy as many visitors as possible. Even though you should be using all of the plentiful technological benefits, you can’t create entire exhibit relying only on video displays, so it’s important to have qualified, communicative and receptive booth team. This includes representatives that have detailed insight into all products, services, companies’ aims and other relevant information that may be requested on-site. 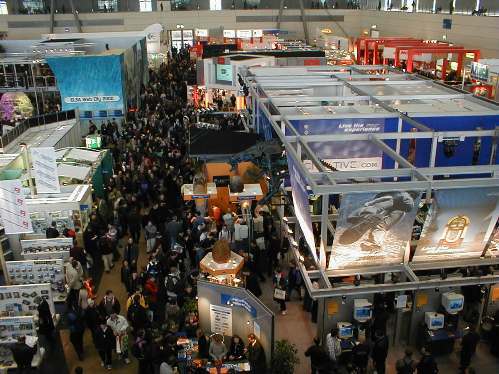 Apart from that, make sure that your booth personnel have some technical knowledge in case surprising issues emerge, but it’s also crucial for them to be able to operate in crowd and noisy trade show atmosphere. Remember that behaviour and attitude of your booth staff also plays important role in creating overall stand attractiveness. As you already know, people are different, and while some don’t have anything against receiving bunch of advertising materials during their trade show visit, others just can’t stand all that paper piles, so the majority of your fliers will end up in trash can. Therefore, it’s recommendable to prepare yourself for every scenario, by offering regular leaflets and alternatives in electronic form. If your visitor is not willing to accept paper materials, he can easily reach digital catalogues or informational leaflets, but you can suggest their downloading or free e-mail newsletters. Fast expanding technological field brought universal application of digital and online solutions, but it seems that their utilization got tremendous significance in advancing marketing activities during companies’ commercial exhibits.